My sister told me she recently bought a 6 pack of Flying Saucers and it was $20.00 !!! What ? Gramps would give us $1.00 and we would run over to Linden Blvd. and get a large chocolate cone with sprinkles for .75 cents !!! -- OMG !! Today a large cone with sprinkles must be more than $5.00 !! 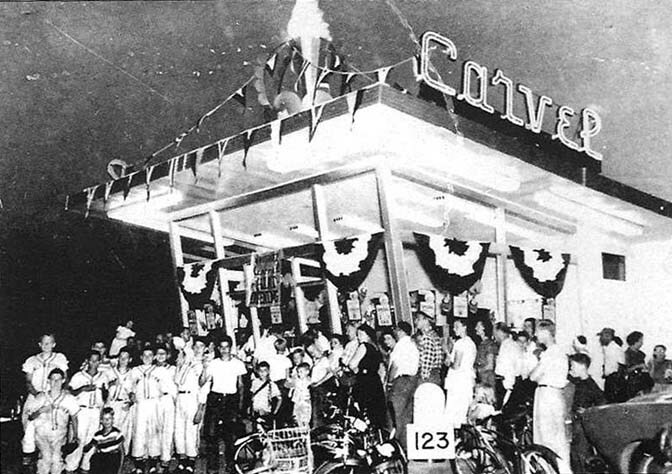 This image is of the original Carvel, situated until recently on Central Avenue in Hartsdale, NY. I met Tom Carvel there when they had a "Fudgy, the Whale" promotion in the 70s. I was simply there for a soft cone. He pretty much spearheaded the class of advertising where the production of the commercial was so purposely cheap and embarrassing, the product and its jingle would stick in your mind, seemingly, forever. Extremely successful and still used today.